If there’s anything special you need, give us a call and we’ll put together a quote for you. We recently built a few of these neat little rack mount dual meters, because they seem like a practical studio accessory, and one else else offers one. Built from repurposed (ie used) VU meters and electronics, this is a 3.5” high (2 RU) panel with two accurate, high quality Sifam VU meters and dual buffer electronics. The panel has a short Mogami cable with two female XLR’s. A pair of small trimpots on the buffer board provide level adjustment — it is designed for +4, but there’s about 16 db of range on the trimmers, to accommodate different levels. 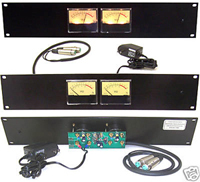 The VU meters are each illuminated by a pair of lamps, and 4 extra lamps are included. The Sifam VU’s feature accurate, familiar ballistics. If you’re running a digital setup with peak indicators but no mechanical VU’s, adding this VU meter will help you to judge the loudness of your mixes. Also, the high resolution of analog VU meters can really be handy for accurately calibrating input and output levels, and for analog metering digital plug-ins. The VU’s were removed from a Sony MXP-3000 console. These are are heavy duty, high quality meters — not the cheap lightweight Sifams often seen these days. The panel is rugged 3/16” aluminum, grained and anodized black (not just painted). The unit is powered by a small 120 volt power adapter. Since the meters are used you may see some small flaws but overall this is a sharp looking unit, and a very practical addition for the home or project studio. The SE 16×2 is a high performance, high headroom analog summing mixer that we designed and built for a large studio facility in Los Angeles. The client wanted a high performance analog summing system in each of their mix rooms, as an alternative to summing in Protools. SE 16×2’s have superb sonics and have been used to mix thousands of television shows and feature films. We are very proud of the performance and specs that were achieved in this unit. Maximum output level is a whopping +30, so you have 26 dB of headroom, for more than most pro audio gear. Frequency response is +/- 1/2 dB from 5 Hz. to 25 kHz. To keep the unit as quiet as possible we went with an external power supply. Signal/noise ratio is -82, THD is .03%. 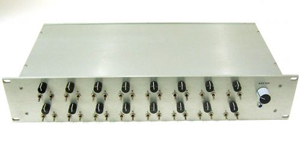 The SE 16×2 has 16 differential balanced inputs and 2 transformer balanced outputs. Each of the 16 inputs has a level control, left and right assign (with a 3 db pad when L and are are selected, to avoid center channel build up) and a master stereo level trim. We used Burr Brown OPA2604’s on all the input stages and a Hardy 990 opamps for the stereo outputs, followed by Jensen JT-123-BL output transformers. Inputs are connected via two 25-pin D connectors (standard pinout) and the outputs are on male XLR’s. With the master level full up, each of the input level pots are unity gain with the knobs in the 12 o’clock position. There’s 6 db of cut with the control all the way down, and 6 db of gain when it’s all the way up. The master level control is normally left full up, but by turning it down you can reduce gain by up to 8 db. The mixer unit has a rugged, custom milled brushed aluminum case with top and bottom covers that slide in and out, for a snug secure fit. Included are the external regulated supply and a power supply cable. The power supply is set to 120 volts, but on request we can change it to 240 for buyers outside North America. Included is a full 6 month warranty. This is a fantastic sounding analog unit that will beat the pants off Protools, any day of the week! As mentioned before it has never been in service, and it is in excellent cosmetic, mechanical, and electronic condition. If you live in Southern California, you’re welcome to come over and demo the unit. When power is restored after a failure, initial voltage spikes and erratic waveforms can damage consoles, monitors, and other equipment. In many cases a UPS is the answer but for larger systems, that may not be practical. Our AC line protector (or “dead man switch”), protects sensitive equipment after power failures. Your equipment plugs into the back of the unit, which contains a heavy duty relay that can only be switched on manually. When the power fails, your equipment is isolated from the AC line until the someone manually resets the box.